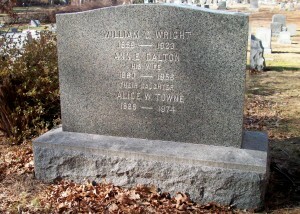 Died: June 13, 1956 in Bourne Ma. at 95 yrs, 9 mos, 22d. Where Lived: Chelsea & Pocasset Ma. 1. Alice Martha Wright Towne; (February 21, 1886 – January 20, 1974); Married George William Towne (1885 -1965 ) (George Moody Towne & Annie Wallace Cruckshanks) in Bourne Ma. on June 24, 1908; George married (2) Ruth Caroline (Norris) Harvey (1886 – 1939) (Lucian W. Norris & Effie L. Osgood) in Yucatan Mexico on January 30, 1926 & married (3) Cecile Marie (Byrnes) Holmes (Joseph Byrnes & Winifred McDonnell) in Dauphin Pa. on June 18, 1945; George died in Stuttgart Germany; They had 3 children; Alice is buried in Pocasset Cemetery with her father & mother.